We’d love your help. Let us know what’s wrong with this preview of The Deal of a Lifetime by Fredrik Backman. A father and a son are seeing each other for the first time in years. The father has a story to share before it’s too late. He tells his son about a courageous little gi In this short story enhanced with beautiful illustrations, the bestselling author of A Man Called Ove and Beartown delivers an insightful and poignant tale about finding out what is truly important in life. To ask other readers questions about The Deal of a Lifetime, please sign up. "Hi. It's your dad. You'll be waking up soon, it's Christmas Eve morning in Helsingborg, and I've killed a person. That's not how fairy tales usually begin, I know. But I took a life. Does it make a difference if you know whose it was?" What an opening! As a longterm reader of Backman I've become accustomed to staying perched on my toes; you never quite know what you'll be getting when you step into his version of reality. Will it be the whimsical, heartwarming atmosphere of A Man Called Ove? Will it be the dark, timely, and poignant world of Beartown? Honestly, I felt this brief story fell somewhere in between. It wasn't quite as heavy as his last full size novel, but it felt a little more sombre than Ove did. Backman tells us in the introduction that this was a short story originally posted in his local paper, was written around Christmas of 2016, and means a great deal to him. In fact, I felt the introduction was just as important as the fictional story that followed, so I beg of you, PLEASE don't skip it. "Does it make a difference if I killed a good person? A loved person? A valuable life? If it was a child?" I'm going to avoid talking about the plot as much as possible, but I'd like to touch on why I enjoyed this read so immensely. This is a love story, an apology, and a reckoning, if you will. Only Backman can provide us with 65 pages of narrative, with no character names and so little detail, and STILL take our breath away. The idea behind this story is simultaneously a tale as old as time and a wholly new idea. The Deal of a Lifetime: A Novella is a classic holiday theme told from a unique perspective that I've not encountered before. "You might be all rich and powerful now. And maybe you do come home with expensive watches and fancy clothes. But you can't fool me, because I know who you really are. You're just a scared little boy." ^^^ This is a common theme across all Backman fiction, but it never becomes unimportant or less emotional. I truly believe one of the reasons he has become such a beloved author across a vast audience is his sheer talent at portraying the emotion behind growing up, the meaning behind the word "home", and how it changes permanently in ways both good and bad over time. Paired with the fact that this fabulous story has a gorgeous cover and lovely full color illustrations throughout, I would heartily agree with Goodreads reviewer Diane S. in her statement that this book presents as "an adult fable". If you're looking for an alternative to the cheesy or romantic holiday tales, I urge you to pick up a copy of The Deal of a Lifetime: A Novella, whether it be from your bookstore or your local library. I debated about writing anything at all. I liked Susanne’s review which ended in ‘enough said’! I find the reviews of this novella as interesting as the story. This story drove me deep into my thoughts ( a ‘little’ odd - aware of the I debated about writing anything at all. And THAT was what was missing for me - which was never missing for me in every other book I’ve read by Backman. In EVERY OTHER BOOK .., there has always been one spot at least where I was crying or at least on the verge of crying. I didn’t even come close. I UNDERSTOOD the story - The regret, the redemption, sadness,... but the transfer to ‘me’ as the reader in authentic ‘feeling’ was weaker than his other stories. Plus... I CAN understand upsets if people paid $20 -something for this book. I’d feel upset if I had too. I’d feel cheated. It’s a normal feeling. It’s 96 pages with pictures. I paid $4.99 willingly—a Kindle read. I was late to even know that one of my most respected authors had a book out. THEY DO PAY for his novels! A 99 cent gift would have had his readers jumping for joy. which was as long as the short story. It’s not a style I like. I rather read the entire book and not have that long of an excerpt presented. Last... I don’t think the book cover- with the Christmas tree... is a great match either. It’s much too festive .. The story isn’t. So... did I LIKE the story? GET VALUE? But..it didn’t KNOCK MY SOCKS OFF either. I’m still glad I read it!! I’m even happy to be part of the community who shares our JOINT LOVE FOR THIS AUTHOR. OUR LOVE FOR HUMANITY expands. We walk away being better people ourselves! Fredrick Backman’s books ARE A GIFT to people! And definitely enjoy his other books!!!!! I have been seeing this everywhere and decided I had to give it a read. I love that gorgeous cover! Honestly I’m not sure how I feel about the story. I’m not going to go into the plot as the description itself is pretty long and goes into quite a bit of detail. I was definitely pulled in from the very first line and enjoyed the story, but just felt a bit like “that’s it?” when it was over. I knew the book was going to be short (96 pages) but I was still surprised when it ended as my Kindle said it was only at 56 percent. I’ve been having issues with my Kindle so I thought it was that, but then I realized the rest of it was an excerpt from the author’s novel, “Beartown”. Because I didn’t see it coming, I didn’t feel like I was at the end of the story and it took me a few moments to sort things out. Overall, I’m still glad I read it, and I look forward to reading more from Fredrik Backman. i love this time of year. its a time of kindness and warmth and giving. its a time that makes me believe in hope and humanity. its a time that reminds us what is truly important in life. and i would lying if i said i didnt put off this book for seven months, just so i could read it during a time when i knew i would need a small dose of that holiday magic. and there is no one better to deliver that than fredrik backman. this story is the epitome of christmas spirit - its a story about what it mea i love this time of year. its a time of kindness and warmth and giving. its a time that makes me believe in hope and humanity. its a time that reminds us what is truly important in life. this story is the epitome of christmas spirit - its a story about what it means to completely give of oneself without expecting anything in return, how selflessness and compassion are what can change a life for the better, and that the best gift is one that cannot be bought but one that is given in love. what a perfect story for the best time of the year. a must read for everyone! A short novella about the meaning of life, death and sacrifice by Fredrik Backman, one of my all-time favorite authors. It is poignant, sincere and heartfelt. A quick, easy read. Enough said. Published on Goodreads, Amazon, Twitter and Facebook on 11.6.17. I read two books by Fredrik Backman this year and enjoyed them both. When I saw The Deal of a Lifetime floating around on Goodreads, the cover and author sent me right into an impulse buy and I used an Audible credit to purchase it. I didn't even read the blurb and assumed I was purchasing a Christmas read. It turned out to be very different from what I expected and my review below might contain something you consider a spoiler if you want to go in completely blind. Although, I don't feel that I reveal anything more than the blurb does. The story begins with a father telling his son a story on Christmas Eve about how he killed someone. He's not disclosing details and you won't find out until the end of the story what really happens, but basically, he knows he hasn't been an exceptional father. He explains that he's been obsessed with his legacy and has chosen what 'he' considers success over being a good parent to his son. That's what's been most important to him--leaving behind a legacy full of everything he thinks is important--wealth and security. Then he meets someone who's dying of cancer and he begins to question the decisions he's made. He begins to question how important life is. Do other people's lives matter? How important is someone else's life to you if you don't know them? If I had been able to get my hands on a copy before Christmas, I wouldn't have had any problems working it into my schedule. In fact, I would have pushed it to the top of the pile, no matter how short or long it was. But, I missed any and all ad camp The Deal of a Lifetime by Fredrik Backman is a 2017 Atria Books publication. When you’re used to being charmed by Backman’s characters, by his stories, this one is a bit different. A different slice of life, Poignant, bittersweet, introspective, and yes, charming, but more in the darker slice of life way, still, look beneath, and you’ll find Backman. A story that examines the value of a life, and how, as life goes by, the value we place on things or people in our lives may change, those who value things over love, money over knowing another person may begin to reevaluate their choices. The value we place on the time we are given here should be infinite, even though the time here is not. "Maybe you will find this to be a strange story, I don't know...Anyway, this is the story. Thank you for taking the time to read it. I purchased and read all your books within a year. How could you take advantage of one of your most ardent fans, by charging me $18 for a not much more than a hardcover greeting card? I've received birthday cards that stirred more emotions within me than "The Deal of a Lifetime." Plus, that title was like pouring salt in "Maybe you will find this to be a strange story, I don't know...Anyway, this is the story. Thank you for taking the time to read it. I purchased and read all your books within a year. How could you take advantage of one of your most ardent fans, by charging me $18 for a not much more than a hardcover greeting card? I've received birthday cards that stirred more emotions within me than "The Deal of a Lifetime." Plus, that title was like pouring salt in a wound. I cannot believe I'm going to do this to you, but I'm putting your second novella on my "terrible-twos" shelf. This isn't goodbye; however, for you've written some of my favorite books. You know that special talent you have for getting us readers to laugh one minute, and then all of a sudden we have tears streaming down are cheeks. Well, I'm not walking away from experiencing those feelings again, but I'll most likely wait for a while, after your next book is released, and see what my friends have to say first. I read this because Fredrik Backman has become over the last few years one of my favorite authors. I read it now because I thought it was a Christmas story, but it really isn’t. It’s a story for anytime, an allegory about how one lives a life, about the importance of knowing what really counts, about love. Moving in many ways, what we have come to expect from Backman. Recommended to all, but especially Backman fans. A very short review, I know but this piece of writing, described as a novella seems even short to be called that, but definitely worth reading. In THE DEAL OF A LIFETIME, a man looks back on his life....reflects on what he missed....what is truly important, and with the influence of a little girl decides to make a change. Just a short novella, but by Fredrik Backman.....always worth my while. ⭐⭐⭐⭐⭐ / 5 because what else would I rate this?? I mean really. I honestly don't think there is anyone that can make me cry like Fredrik Backman can. This teeny tiny 65 page novella gave me ALL the feels. I love his short stories with their beautiful illustrations and the gut wrenching "lessons". Backman is by far one of my favori ⭐️⭐️⭐️⭐️⭐️ / 5 because what else would I rate this?? I mean really. I honestly don't think there is anyone that can make me cry like Fredrik Backman can. This teeny tiny 65 page novella gave me ALL the feels. I love his short stories with their beautiful illustrations and the gut wrenching "lessons". Backman is by far one of my favorite authors and I will read anything this man writes. There isn't much else that I have to say about this short story except it is beautiful, moving, super fast to read, and you should totally read it. Especially if you are an avid fan of Backman like I am. I have loved everything he has written that I've read so far. I just can't sing his praises enough!! Some food for thought and perfect for the holiday season. Short but introspective. Beautiful cover art and many uplifting reviews from my GR friends led me to this one. May each reader take what they will from this novella. Fredrik Backman is special and does not cease to amaze me. Not my favorite of Backman's work, honestly, but it was a sweet, quick read. An introspective fable reflecting on the choices we make and the differences in people. This is a perfect fit for the upcoming holidays. The Christmas season is a time for caring and sharing, giving and receiving, friendship and fellowship. Often during this time of year we find ourselves considering what we value and what others value. We consider who we are, and what we will leave behind. We all long for that which we don't have. To go back and make better choices, make up for our mistakes, cho An introspective fable reflecting on the choices we make and the differences in people. We all long for that which we don't have. To go back and make better choices, make up for our mistakes, choose a different path. But who is to say whether we've made the right or wrong choice, or even what the right choice is. People are who they are, no matter who we want them to be. Our choices are what makes each of us unique and wonderful individuals. No matter what we choose to do, we are setting the course for our lives and those close to us. We are making a choice of this over that and it is only in and through those decisions that we grow and learn and live. Not too much to say about this. A very short novella, with a warm ending and a poignant realization along the way. An adult fable, if you will, pictures and all. Nice heartwarming story and a quick read. Though provoking and so so wonderful! If all else fails this year, at least I’ve discovered Fredrick Backman. Got this gem as a Christmas present and started listening to it on my drive to see my family on Christmas day. It finished right as I was pulling into their driveway and the tears were just drying in my eyes. Though it is short, it is mighty. A short story told about an absent father making a deal for the greater good. The tiny nuances are what stood out for me: the gray sweater, the red thread, the city as it appeared... Backman is such a gifted storyteller and I could just picture him writing t Got this gem as a Christmas present and started listening to it on my drive to see my family on Christmas day. It finished right as I was pulling into their driveway and the tears were just drying in my eyes. Though it is short, it is mighty. Question to Self: What are you ready to do for your loved one? Yes, everything and anything. Cross my heart. Fredrik Backman does it again! And, this time when life's turmoil is at it's peak, when it's time to take some (or maybe one) tough decisions. Am I really ready to do everything and anything, for my loved one? "You humans always think you're ready to give your lives, but only until you understand what that really involves. You're obsessed with your legacy, aren't you? You can't bear to die and be forgotten." Why are we always on this treasure hunt? Why is "good enough" and being contented not enough? "You were always someone who could be happy. You don't know how much of a blessing that is." Nov. 1, 2017: I read this one time through, but I can tell there's more to get out of it that I didn't pick up on. I'm rereading this today, and I'll rate it after an immediate reread. Delightful, sad and hopeful at times, and like everything Backman writes, beautifully rendered. That was fast. On audio, this short story is approximately 45 minutes long at regular playback speed...which is about 23 minutes for me lol. I do not have time for slow narration so I crank that baby up! Overall, The Deal of a Lifetime was a likable story about so many things but mainly it provides perspective about what the ultimate sacrifice might look like. The author suggests it's so easy to say you would give your life for something or someone but is anyone actually selfless enough in our h That was fast. On audio, this short story is approximately 45 minutes long at regular playback speed...which is about 23 minutes for me lol. I do not have time for slow narration so I crank that baby up! Overall, The Deal of a Lifetime was a likable story about so many things but mainly it provides perspective about what the ultimate sacrifice might look like. The author suggests it's so easy to say you would give your life for something or someone but is anyone actually selfless enough in our human core to follow through? Frankly, I've yet to read a Fredrik Backman book that has won me over. I honestly don't know what it is. We're just not compatible I guess, but I didn't hate this little piece. The message was admirable and I liked it overall. Lightening fast read!! I love this author, I wanted this to be a longer novel not a novella. "The only thing of value on Earth is time. One second will always be a second, there's no negotiating with that." A man writes a letter to his son on Christmas Eve. He tells him he has taken a life but before he can tell him whose, he has to tell him why. A noted personality, this man found success in business but all his achievements came at a steep price and its time to pay up. Fredrik Backman does not dissapoint. I actually planned on reading this novella around Christmas but the book did not a "The only thing of value on Earth is time. One second will always be a second, there's no negotiating with that." Fredrik Backman does not dissapoint. I actually planned on reading this novella around Christmas but the book did not arrive til a week ago. No worries though because this gem of a book is not explicitly Christmas-themed. Rather the message is a universal and timeless one. Backman has already proven to be a talented author writing books that range from being witty and humorous to introspective and profound. 'The Deal of a Lifetime' has the whimsy and heart of 'Ove' and 'Britt-Marie' and the insight and depth of 'Beartown'. With a simple yet elegant prose, this brief but oh-so-wonderful book introduces the reader to a man that makes the ultimate deal. While he and the remaining characters remain nameless, their stories are touching and quite profound. Backman conveys a hard-hitting narrative while also delivering a hearfelt message and does so brillantly. At the risk of giving away the plot, I will leave it at that. I love this book so much! It was definitely worth the wait. Any Family Guy fans here? Brian Griffin (the dog) is an aspiring author who writes the hackiest crap ever (his debut novel was titled “Faster Than The Speed of Love”!). 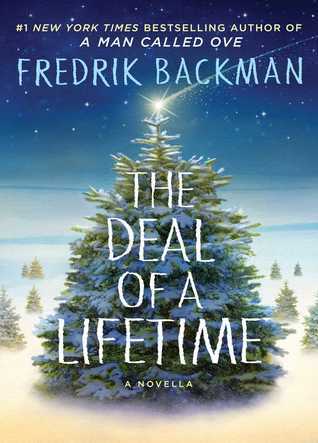 Reading Fredrik Backman’s The Deal of a Lifetime was like reading what I imagine one of Brian’s books would be: beyond contrived, comedically sentimental and clumsily manipulative. The framing device is a letter from a dying father on a cancer ward to his estranged son. I won’t say any more because that’d reveal the whole farcica Any Family Guy fans here? Brian Griffin (the dog) is an aspiring author who writes the hackiest crap ever (his debut novel was titled “Faster Than The Speed of Love”!). 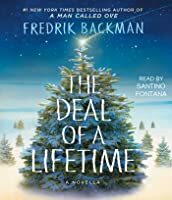 Reading Fredrik Backman’s The Deal of a Lifetime was like reading what I imagine one of Brian’s books would be: beyond contrived, comedically sentimental and clumsily manipulative. The framing device is a letter from a dying father on a cancer ward to his estranged son. I won’t say any more because that’d reveal the whole farcical tale but it involves regret, Life Lessons, and a five year old girl at death’s door. Oh and Death. Who’s, y’know, a person. Oh, the originality! Live your life like it's the last day, every day. That's the basic message of this short little book. Don't take anything for granted, spend time with your family, your spouse and kids before life is over. Make time for simple pleasures. Enjoy every moment. زن رو ترش کرد و خیلی خیلی بهش برخورد:" من مرگ نیستم. مرگ شغل من است." برای نجات زندگی، باید از بعضی چیزها بگذرید و این قصه کوتاه درباره همان چیزهاست. داستانی شاید کمی متفاوت از مرگ به شیوه فردریک بکمن!